Calling all pop-punk, alternative, and rock lovers: The Faim, an Australian group originally created in the small town of Perth, will be playing Fubar in Saint Louis this Saturday, November 17th, alongside Hands Like Houses. With the way modern-day music can be, it’s sometimes a bit questionable as to whether or not these “pop-punk/rock” groups are really fitting into that category of music. All of our beloved punk groups, such as Fall Out Boy and Panic! at the Disco, have tweaked their styles to accommodate to the ever-changing demands of the music industry. As a personal lover of punk/rock groups, I haven’t been too impressed with some of the music that has been released lately. For many, the genre is dying and most depend on Fall Out Boy and Panic! at the Disco to hold onto the last bit of hope that modern-day punk/rock can be enjoyable. I was personally losing hope; I had yet to find an upcoming band that made me believe a quality punk group was still out there. Then, I was introduced to The Faim. Many are unfamiliar with the band, as was I, and that’s due to where they got their start. Perth is a small town in Australia, and it’s incredibly difficult for a local band to make their mark in the music industry. Originally called “Small Town Heroes,” Josh Raven (lead vocals), Stephen Beerkens (bass and keys), and Sean Tighe (drums) worked rigorously in trying to prove themselves to the world. John Feldmann, who worked with All Time Low—one of the most memorable punk bands for lovers of the genre–replied to a message sent by the lads and offered to work with them. That’s when the game changed. 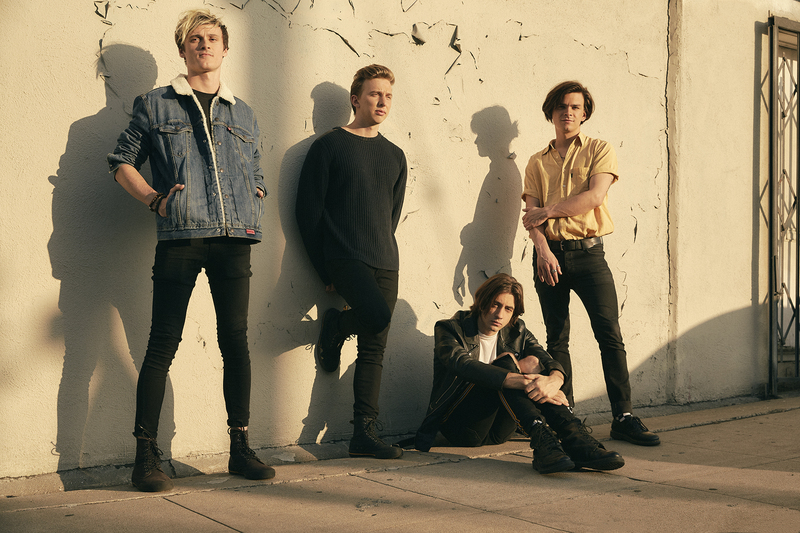 Changing their name to “The Faim,” the boys began working and writing with well respected artists such as Pete Wentz (Fall Out Boy), Josh Dun (Twenty One Pilots), Ashton Irwin (5 Seconds of Summer), and Mark Hoppus (blink-182). These boys became celebrities overnight, and are surely going to be taking over the music industry. With fame, however, comes trouble. Michael Bono, who was the original guitarist for the group, recently dismembered himself from the band to address allegations against him. The groups’s replacement guitarist, Sam Tye, took over. I had the chance to talk with the charming young man, and though he did not wish to comment on the topic of Bono, he gave me some insight as to what it was like to work with such well respected artists. Though working with big-name artists was absolutely crucial for this band’s development, they stick to their own unique style. Sure, it sounds like a punk/rock group, but the lyrics aren’t typical, and the feeling it gives you is different. I’ve searched everywhere for songs that make me feel something. Their EP “Summer is a Curse” has been the first catalogue of music in a long while, coming from the punk/rock genre, that has caused me to feel this drop in my stomach. Josh Raven has a hell of voice, and you can feel the emotion in it through every word, and every riff. If a musician can cause such an unexplainable, yet delightful feeling when listening to their tunes, it’s almost unimaginable as to what they can make you feel during a live show. Sam Tyne says, “We like to keep it diverse in a show. You can expect a rock show. Josh kills it on the vocals, Stephen is shredding it on the bass and keys. Shawnee gives it his all on his drums, he has a lot of energy. You can always expect a lot of energy and a rocking show. There are some down moments, and we take the time to really connect with the crowd because they’re the reason we’re there. The shows are always about passion, and the audience will feel that when they come to a show,” Stage presence, as I’ve preached many times before, is so crucial to a well done and memorable performance, and I have very little doubts of this band failing to meet those expectations. Give their EP “Summer is a Curse” a listen and understand this band is special. “Make Believe,” one of my personal favorites, as well as Tye’s, is more on the emotional side, but yet it’s a head-banger with killer hooks. Out of all the songs on this EP, “Make Believe” is the track that can cause a tear to be shed because of the passion in Raven’s voice, and through the very real, very heart-wrenching lyrics. If you miss what punk/rock used to be, if you miss listening to bands from this genre who can give you a good-ole unexplainable joy, give The Faim a try on November 17th. You won’t be disappointed.